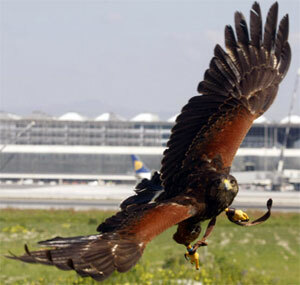 Hawks and eagles are in charge daily of removing the remaining birds and ensure flight safety at Malaga airport. Much has advanced aviation technology in the last half century, but when it comes to keeping at bay the birds trying to fly over the airports, nor ultrasound systems, laser guns or robots have proven useful worldwide. The only really effective thing for chasing them away and ensure that no bird impacts against a plane is an ancient practice in which the fastest natural predator par excellence, capable of a dive speed of 390 kilometers per hour, marks the limits of the sky by only deploying its massive wings. All 23 falcons and eagles have a name and are part of the large device that every day is responsible for ensuring that nothing goes wrong in the strict security at Malaga airport through which pass thousands of travelers daily, a job for which they have been meticulously and thoroughly trained. It depends on them that the aircraft can take off and land without invasive birds endangering the device. Also, as any other employee of the airport, they have set a shift to ensure a well-deserved rest.